Two weeks ago, the fitness subscription service ClassPass launched in Toronto (and Vancouver as well!). I was so excited to be asked to be a ClassPass ambassador and to be given a trial of the service because I recently made some lifestyle changes: after a few years of trying to work out at home (a difficult thing, trying to do burpees when you live on the second floor of a house and want to maintain civil relationships with your neighbours), I re-joined a gym and started running again in February. I really committed to clearing space in my schedule for working out. For me, when I commit to something like this, it takes up so much of my time and energy and it’s all I can think about! But nearly every friend I have seen in the past few weeks has had to listen to me talk excitedly, all wide-eyed, about exercising. I credit it with helping me get through some incredibly difficult times this past winter. I’m really shy about working out in public—I’m sure a lot of people can relate, and I could write a whole blog post about this alone—and taking advantage of ClassPass has really helped pull me out of my comfort zone. It can be a little intimidating to walk into a new studio and try something completely unknown, especially if it involves working out in front of mirrors, but I always feel proud that I did it afterwards. This membership has given me that extra push as a wide world of workouts opened up for me. The gym I joined is very basic; there are no fitness classes, so I only use the treadmills and weights. I love classes, though, so ClassPass has been an invaluable addition. 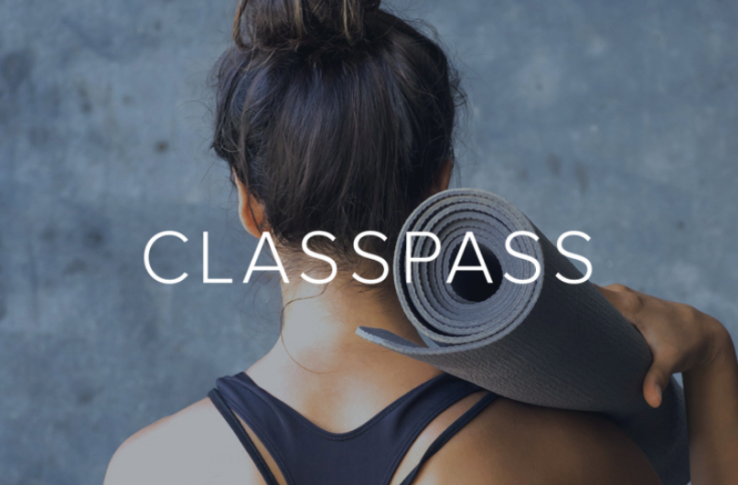 ClassPass works by giving you access to three workouts per month at various studios across the city. You can take a yoga class on Monday, a boxing class on Tuesday, and a barre class on Wednesday. I love the idea of challenging myself in a totally different way with each workout. There are some limitations, however—some studios block ClassPass access to some of their more popular classes, and if you schedule a class and don’t show up, you will be charged a fee. There is enough variety even with the three per month limit that you could take a class or two per day, every day, if you wanted to. They have a great app that lets you schedule on the go and that sends you reminders. Here is a list of cities in which ClassPass is available. If you’re in Toronto or Vancouver and are interested in ClassPass, follow this link for $50 off your next cycle (that is, after your first month; offer good until March 31, 2015). The best part of ClassPass, however, has been the opportunity to new studios. We are so lucky to have so many amazing ones in the city! Nearly 100 studios in Toronto are participating in ClassPass, and here are a few of my favourites so far. I have so many more to try, though, such as Surfset. I’ve followed Misfit on Twitter for maybe three years now and had never visited (for no good reason! I always wanted to) before ClassPass. Misfit offers a variety of movement classes from yoga to Pilates on a Reformer, to a technique called Essentrics, which involves a Tai Chi-like flow. This space, in a former church, has a wonderful & loving vibe, true to their name. I sat in on a pay-what-you-can meditation class after Pilates on Sunday and it left me feeling floaty for the rest of the day. They also happen to have a seriously delightful Instagram account. Studio Blue is in my neighbourhood so I had been there before and had loved it. This intimate studio offers some of the most challenging yoga classes I have ever taken, but the instructors always have a great sense of humour and are very welcoming. Their approach to yoga is pretty playful; for example, one of their classes is called Hangover Helper. I’ve never taken the Blissful Relaxation class but a friend of mine described it as a group nap, which sounds pretty delicious after a tough week. The yoga room here is heated. Not to excess, just nice and warm. Lovely in winter. Classes at Big Hit involve putting on some hot pink boxing gloves and punching and kicking a man-shapped rubber dummy to loud music. It’s intense and hilarious and so fun! I was panting through this workout but I felt so powerful. As someone who isn’t normally very aggressive it took me a while to get past the freaky feeling of punching a person in the face, but I would recommend it as a good way to get some anger and frustration out! The 45 minutes flew by. I took the introductory class at Barreworks, but I’m excited to go back and try a regular class. It’s a beautiful space and the workouts make you feel so elegant, even if that isn’t a naturally-occurring feeling in your body! This is a pretty busy studio and classes fill up fast, but they have an uptown location I’m going to try soon.